The ProCure Center will host a tour and anniversary celebration Saturday, Oct. 22, from 11 a.m. to 3 p.m. In 1946, founding director Robert Wilson was one of the first to tout the benefits of proton therapy. The cancer treatment has since been lauded as a way to minimize damage to healthy tissue while focusing a finely calibrated beam directly on the tumor - an impossibility for radiation treatments based on X-rays or gamma rays. Yet protons were not used within a hospital facility until 1990 with Fermilab's construction of a particle accelerator at Loma Linda University Medical Center. Since then, the industry has grown and the technology has evolved. 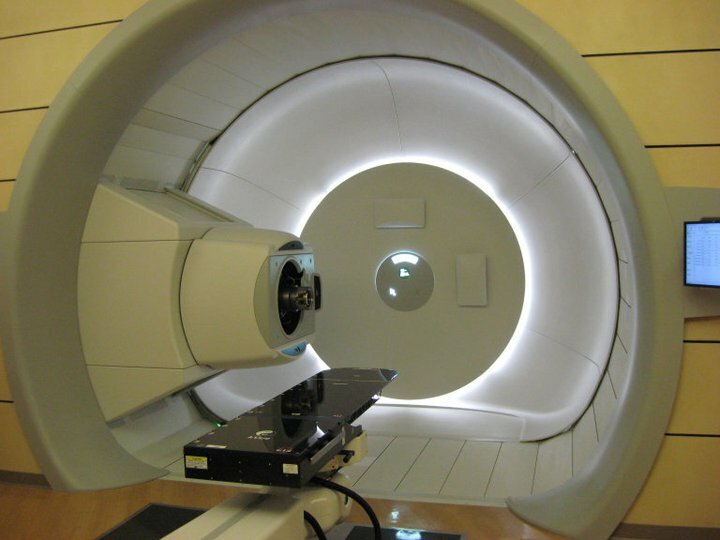 Worldwide, 37 centers use proton therapy and more than 73,000 patients have been treated. The ProCure facility in nearby Warrenville, Ill., one of nine operational centers in the U.S., is completing its first year of proton therapy. The facility uses an accelerator called the Cyclotron to administer the proton therapy. One distinction that sets the Cyclotron apart from other accelerators is that the particles are sped up to just 230 MeV, an energy high enough to treat tumors as deep as 32 cm within a patient. The proton therapy process begins with the transformation of hydrogen gas into plasma. The Cyclotron speeds up the particles and isolates the protons along a curve of magnets that lead to one of four rooms within the treatment center. With the aesthetics of a set piece from "2001: A Space Odyssey," a large gantry device rotates the beam line on a track and the patient, lying on a platform, is precisely positioned by a large robotic arm similar to ones used in automotive manufacturing. Here the proton beam is slowed to an energy that will reach the tumor and be absorbed by the cancer cells but go no further, while a brass aperture on the nozzle narrows the beam into the shape of the tumor. For the beam to be a precise match to the tumor, the aperture is designed for each individual patient. Mingcheng Gao worked with DZero as the detector went operational and is thrilled to use the skills he gained at Fermilab as a senior medical physicist at the ProCure facility. "The technology is advancing quickly," he said. The price of building and running each proton therapy center has been the field's greatest hindrance for decades. After 22 months of construction, the ProCure center ultimately cost $150 million to build. Yet with the increasing demand for proton therapy, Gao sees proton treatments playing a larger role in fighting cancer. "The cost will definitely go down in the future," he said.